The last two days here have been damp and foggy; even the birds stayed away from the bird table (I think they are afraid of the Sparrowhawk when that sort of weather descends). Now, today, after a morning of heavy rain, which has cleared away the vestiges of the fog, the sky has patches of blue, there is a breeze and now and again the sun comes out. So much better weather. My visitor has just rung to say that she is running late and will not be with me for another two hours. As I am all ready for her arrival I have a couple of hours to myself. The farmer has lit the multi fuel stove early for me and I have a good book, so I shall go and sit by the fire and relax. do try and get hold of it - it is excellent. He is such a brilliant writer. Thick fog lasted all yesterday and is only as I write beginning to disperse, replaced by fine rain. The kind of thick fog we get here is usually only dispersed by rain - I think it is something to do with the height. Further east it seems to have been a much better day. Today is our Poetry day and I still have to choose some of my contributions. So far I shall read Cynnddylan on his tractor (R S Thomas), Wild Geese (Mary Oliver) and Wordsworth's View from Westminster Bridge. So I need a couple more. Tomorrow I have a visitor coming to stay so blogging may take a back seat for a day or two. I am telling you in advance because last time I missed posting for a couple of days folk thought that maybe I was ill. Very thoughtful of them, but no I am in good health and looking forward to my visitor. What to do on a foggy day. Today there is thick fog. As the day has gone on the fog has thickened and there is no sign at all of the Autumn sun burning it off. Now it is half past three in the afternoon and so soon the dark will be coming down. What to do on such a day. The farmer always finds jobs to do. This morning he took his fancy little digger five hundred yards down the lane to dig out a ditch for a neighbour. I went into town with friend W as I usually do. We both did our little jobs and then met with friend C in our favourite cafe for scones and coffee. We sat in the window and before long friend W walked past;we knocked on the window and she came in and joined us. For a good hour we just sat and chatted over our coffee and scones and so passed a pleasant morning. Now, late afternoon, as it gets dark and the fog thickens, it is time to light the log burner, empty the dishwasher, feed Tess and settle down to watch Antiques Road Trip - one of my favourite programmes. Not a wasted day at all and one with plenty of laughter this morning with pleasant company. Our clocks have gone back for an hour, so it is dark in what yesterday seemed to be like fairly early afternoon. All the old hens were in when the farmer went down the fields with Tess on her afternoon walk but the new pullets, who have really found their feet now, were still out in the paddock in the semi dark scratching about. Now, when it is really quite dark, the farmer has just gone down to shut them in. But when he came in the farmer informed me that we shall have one hen less by morning. One of my very old rare breed hens, a lovely blue /grey, has been getting slower over the last week and today she has not left the hen hut, staying quietly in the corner away from the others. She is probably about ten years old so I am content to know that she has had a happy and contented life and is fading out gradually. The farmer also reminded me that she was the one who liked nothing better than to go broody, sit on eggs and rear a clutch of babies, which she would guard fiercely. (he won't let me have a cockerel now because so many of the chicks are themselves cockerels and it becomes hard to know what to do with them). We were reminded of the days when we had dairy cows - pre Foot and Mouth Disease - and they all had a number freeze branded on their rumps. The one we knew best was number 55, who adored new born calves and would always be present at any birth out in the fields in the Summer. And after the birth she would do her level best to coax the new born away from its mother so that she could look after it. Many's the time we have had to chase her off so that the calf could get its mother's colostrum quickly. So I shall be sad to say farewell to my hen - but at least she has had a good life. On a different subject, we were out at friends last evening for a delicious meal (beef in beer). They also farm and have an owl box fitted in one of their barns. This year a barn owl pair raised two chicks which appeared to be doing well. Then one day they found one of the chicks, almost fully grown, on their farm lane looking lost and bewildered. A picked it up and took it back to the box (incidentally he says its talons clasped his fingers so tightly that he found it extremely hard to prise them off). Some days later he found it on the lane again - this time it was dead. He sent it away for analysis as to why it had died. Sadly they said it was emaciated and had literally died of starvation. And this in a year when barn owls seem to have done very well round here. So one wonders why. I hate to admit that there are some jobs which men seem to be better at than women (and vice versa) but today there has been a case in point. The farmer's shooting season has started today and he set off to join the shooters as they reached our land at around 10am, packed lunch in his rucksack and good, strong walking stick in his hand. He doesn't shoot but likes to go along for the ride and to act as part time beater when necessary. I had various jobs lined up. I had to go into town with a little list of jobs. As I went out of the door (trying to avoid the accusing look of one Border Terrier who thought she had a right to come with me), I had such a performance locking the mortice lock on the kitchen door. It is never easy but was particularly hard today. Then into town to the electrical shop for some halogen bulbs. Our halogen lights in the kitchen blew a bulb last night and we used our last one as a replacement. Then, leaving the car outside the shop, I walked up the hill to buy a bottle of wine for tonight when we have been invited out for a meal. Then it was a walk back to the car again and a drive to the Library to change my library books. An hour later I arrived back home to find that the key would not unlock the door. I tried and tried, to no avail. Tess sat just inside and watched as I repeatedly tried to unlock it but nothing happened. Luckily there was a young man working in the yard so I went to get him - could he help? No - he tried and tried but nothing would budge. Then I remembered that somewhere in the depths of the farmer's drawer 'for everything' there was a spare key. I didn't want to ring him and interrupt his day's activities, so I took everything out until I found the key. It wouldn't open the door either. But after fiddling with it for a minute or two C got it to work and at least I got into the house. So a massive thanks young man - you really helped me out of a hole. I had only been back about a quarter of a hour when the door bell rang. I went immediately to the door but there was nobody there.That is still a mystery. Then ten minutes later my carabinieri, which is made of wood and is quite large, suddenly fell off the wall with a loud clatter. Is somebody trying to tell me something here? I am glad it is still daylight outside and that the farmer will be back before dark!! Come off it ghoulies and ghosties and things that go bump in the night - Hallowe'en is next week end not this week end. Tomorrow is the last day before British Summertime ends, the clocks are put back one hour and darkness falls before tea time. To be honest, the fact that for a little while it is lighter in the mornings always seems totally unnoticeable to me. But it all means less time to do things outside and more time inside. To this end I have been trying this afternoon to finish off my bulb-planting. All but one dozen of the daffodils are now in the ground and all the crocus. (the snowdrops I never disturb). There are about a hundred tulips to go in but it is still plenty of time for those. How lucky we have been here inWensleydale with the weather this Autumn. Our River - the River Ure - can reputedly rise as much as twenty feet in an hour in pouring wet weather as water runs off the fells and down all the becks to join the main river. This means that at key points along the Dale is becomes impossible to get through. There is a high road and a low road, and by crossing from one to the other at certain points it is usually possible to negotiate the Dale with difficulty. This year there has not been one single day when the Ure has been high. The Syndicate shooting begins tomorrow so that the farmer will be out all day and I shall have the day to myself - I shall go out with my secateurs and cut off several rogue shoots I have spotted on the climbing roses, I shall go to the Library and change my books, I shall spend an hour on the jig saw which is calling from the table and then I shall get ready to go out to friends for dinner in the evening. A nice, relaxing day - hopefully. As I started to type this post after writing the heading, it brought to mind a rhyme my father used to say to me all of seventy-five years ago. I used to pester him to tell me again and again. assembled in the cave together. the brigands and the chiefs were.......and so on. Anyway, enough of that. It was a stormy night here last night and the wind was up to howling force. This morning the evidence was everywhere, not least in our farm gateway, where there was a sleeping policeman of pine needles which the farmer had to move before he could get the car out and go to fetch the papers. Now he is on with the task of sweeping them up. I have just sneaked out and taken a photograph of him doing just that. Now, at ten in the morning, the wind has abated to a light breeze and the sky is gradually clearing; the storm clouds floating away out east (watch out for them Thelma) and puffy clouds and blue sky taking their place. As usual, Autumn (and October in particular) is capricious. The farmer has just come in for his lunch and to say that he has just seen his first flock of fieldfares for the Winter - about fifty or so birds here from Scandinavia. They were settling in to eat the hawthorn berries; they will demolish the whole crop and then move on to pastures new. Such a wonderful wild-seeming bird - almost exotic - and always a delight to welcome. An abnormal amount of clucking under the walnut tree alerted the farmer this morning to a pullet nest with ten eggs!! So from today they are to be let out only after mid-day until they learn to lay in the nest boxes, As he has been keeping poultry all his life, who am I to argue? Tomorrow, when I have (or rather had) a free morning, I shall now break them carefully one by one into a basin and make a fruit cake with them, so that they do not go to waste. This afternoon has been exercise for the over sixties - I can't say that it gets any easier as the weeks go by. We exercise the top half of the body (I find that very easy), then the trunk and the legs (harder) and then for half an hour we do movement exercises to music (very hard). By the end I am ready to drop off my perch. But half an hour's sit down with a cup of tea and I am raring to go again. I do also feel for the Queen who has to hold such banquets whether she agrees with things or not - admittedly she doesn#t sit there pondering over the menu, nor does she have to lay the table and cook and serve the meal - but she does have to be there, be courteous and welcoming (always) and look as though she is enjoying it. China is such a powerful country, a country which my late first husband (who lived there for some years in the 1930's) thought was a wonderful country. He loved the people and when we returned in the seventies he loved it even more, when he saw the improvements in living standards, housing and the like. Luckily I really don't have to give an opinion on what I think to the present state of affairs between our two countries - I am too old for it to really affect me. Please note that after reading today's paper I find thatr Jeremy Corbyn did go after all to the State Banquet and that he did wear a white tie. He has gone up greatly in my estimation - I am so glad he changed his mind. Prince Charles's reason for not going was an altogether different kettle of fish - I understand it was a protest against the Chinese use of ivory. This is going to be a long and hard 'habit' to break and I do respect him for a protest. No post yesterday because friend W and I were out for the day. Our last visit of the year to Kirby Lonsdale to meet our friends - and what a journey it was. There is no doubt that the scenery has never been more beautiful. I didn't take any photographs - selfish of me I know - but I just wanted to enjoy the Autumn colour. The sun shone all the way there and lit up the leaves - all colours from pale yellow to deep red. The fields were full of cattle grazing off the last of this Summer's grass, or sheep in the Autumn sunshine. By the time we returned the sky had clouded in and yet still it was all beautiful. Today, after meeting friend C for coffee and a scone it was home to cook the lunch, then walk Tess and then go on another beautiful drive just a short distance and to the most unlikely place for beauty. The refuse collectors forgot to collect our paper and plastic on Friday, so I took them both up to the tip. The tip itself is well hidden, a half mile drive off the main road. The lane down is fringed with trees in Autumn leaf. One side is a fairly steep bank but the other side looks over green fields and stone walls (again the fields are full of sheep). I have to say that the tip itself, constantly manned by a couple of charming helpers, is absolutely immaculate. The chap unloaded and emptied my containers cheerfully and I drove away very impressed. Then it was back to plant up another container with sixty miniature narcissi and a handful of crocus. I am now searching for some large purple striped crocus - I have tried everywhere and they seem to have disappeared off the face of the earth. I have left a corner for them in my planter - so live in hopes. I took Tess out into the yard with me as she enjoys sitting in the sunshine (and it is another nice day). She disgraced herself (and me) when three Jack Russell terriers and their owner walked past. For some reason she hates them with a vitriol and went berserk, disappearing up the lane. Totally ashamed I apologised to their owner and pushed her indoors, where she sat dejectedly while I finished my job and cleaned up. Off to get the tea now. A Present for the Farmer. Our ten new hens have settled in well. They are now out and about, roaming the fields around the farm, scratching for and eating beetles and worms. They come back at dusk and go into the hen house and although they are together with my old hens all day in the fields they still go to bed on their own side of the hut even though the door between is left open. They are now using the perch at night and laying in the nest boxes - nine of the ten are now laying - so we were happy in the knowledge that they were 'at home' here. So imagine the farmer's surprise this morning as he went to get on his tractor. (He had already let the hens out and fed and watered them). As he walked towards the door of his tractor he heard that particular cackling which means *I have just laid an egg* and there, on his tractor seat, were two deep brown pullet eggs - both still warm. He came in with them in his hand chuntering that the 'flippin' hens had started laying away. I had to remind him that hens have small brains and that embedded in these brains deeper than anything else is the phrase 'propagation of the species'. In other words try laying your eggs somewhere where the man with the egg basket is not going to find them. Mind you, I did say they had small brains - the tractor seat is hardly a place where he is not likely to find them - more likely to sit on them I would have thought. However, he has told them in no uncertain terms that once more and they will be left in in a morning until they have learned their 'nest box lesson'. We did once have an old hen - one who loved to nurture chicks - who went away and we presumed the fox had got her until one day she turned up with a flock of chicks behind her - she had hidden her eggs in the hedge bottom and hatched them off there. Did anyone else watch Michael Portillo going through The Balkans by train to Istanbul? What a marvellous programme - I love every series he has presented and this is no exception. I have spent some time in Istanbul, so it was lovely to see places again. But the places in Bulgaria I hadn't seen and it was amazing to see them all and get just a taste of what life was like there. The whole programme is also enlivened with his choice of jacket - last night a peppermint striped one, a yellow one, a deep pink one, a green one and a deep blue one - all with contrasting trousers. Sartorial elegance or what (the farmer leans towards the 'what?' side). Next week he journeys from Vienna to Trieste jackets a-blazing. Would be nice if Gwil were on the train to give us a wave. I have to say that now my mobility is somewhat impaired and this kind of journey is almost impossible to make, being an armchair traveller is definitely the next best thing. No case to pack, no mountain of clothes to wash on return. What's not to like? It seems to happen up here every year. We have a long spell of days when the weather is quite warm, when there is little or no wind and when the last of the Summer flowers flower their hears out. Then one morning you wake and it is seriously cold. Today is such a day. Gone is the pleasant Autumn weather and in its place is a sunny (finally) but breezy and cold day. In town this morning for our usual coffee meeting, I intended to buy bulbs to plant for Spring in the large tub the farmer prepared for me with totally new compost as the old stuff was choked with weeds. I planned to make groups of various dwarf narcissus interspersed with purple striped crocus (my favourite). Alas the crocus were just not available anywhere in the town, so I bought three lots of dwarf narcissus (different varieties) and must now leave them until I can find some crocus. Because it is so cold I can't say I am all that sorry not to be out well wrapped up and busy planting. Tomorrow is another day as they say. Do you remember that a couple of weeks ago we bought ten new pullets? We have finally let them out and they are happily foraging round the paddocks near to the house. The farmer has rigged up a light inside the hen house (low wattage), just enough to fool the hens into thinking it is daylight for a little longer. Now we have eight or sometimes nine of the pullets laying. The light comes on on a time switch so is no effort. I am sorry but I just cannot embrace what is these days called 'casual' wear. Yes - I can wear trainers - but only on a very relaxed occasion and only with jeans , never with a skirt. And ditto for T shirts - I have plenty of these for Summer wear (mainly) in various colours and patterns and jolly useful they are too - when I am walking round town, meeting friends for coffee, going to my exercise class. But I wouldn't consider going to a wedding wearing one or going to any formal occasion for that matter. And if I were invited to any 'function' then I would be careful to dress in what I considered an 'appropriate' manner. I almost always wear trousers but there are quite formal trousers for women - trousers and jeans do not have to mean the same. And if I were a man then I would still consider a suit to be an important part of my wardrobe. So I suppose most people (judging by what I observe as I go about the daily round, the common task) would strongly disagree with me. Of course times have changed and we all have to keep up with those changes (to some degree) but I do sometimes wonder whether things have gone too far. My mother and father were photographed in 1910 with my sister on my mother's knee in what I have always assumed was their wedding photograph because my sister was born before they were married and they married when my father reached twenty-one a few months later. She wears a formal, black suit touching the ground, a neat blouse, buttoned boots and a picture hat. He wears a suit and a cap (!) and carries gloves. Well, thank goodness those days are over. But as I have said before on this blog, when I went to Teacher Training College in around 1967, although I got there on a Lambretta scooter I had to change my trousers for a skirt before going into class. By the time I left three years later there had been a clothing revolution. Wow, not half. But I really do think we have gone too far the other way. All T shirts (mostly unironed and therefore creased) seem to be a uniform khaki colour (all washed together?) and jeans seem only to be fashionable if the knees are wide open to the elements and the bottoms are frayed. Alright - call me a miserable old git if you like. But when I sit in our Doctor's surgery waiting to be called and I look round, everybody looks so down at heel and 'tatty' - often look as though they have spent so much money on their hair that they have nothing left for smart clothes. There you are then - that's put the cat among the pigeons. There is a new programme beginning on TV tonight and for the next four nights. It is called Harvest and catalogues the autumn harvest of various crops in the UK. I know I go on about this each year, but it never ceases to amaze me. Last week they harvested the wheat in the fields opposite our farm. Within a day of cutting and leading away the corn they were there collecting up the big bales. The next day they manured the two fields (the crows loved that) and yesterday they ploughed in the manure. The fields looked beautiful - brown and so fertile-looking. Tonight - in the dark and with lights blazing down the field, two units are now sowing next year's crop. How our ancestors would have gazed in awe. Last week in our local paper they published a photograph of a local town in the past. I looked at it - the buildings were more or less the same, but the cars, the clothes, everything else, looked as though they were from antiquity. Then I looked at the date. It was taken in 1950. I was eighteen years old and I thought I was the bees' knees with my hairstyle, my dress, my demeanour. Oh how time marches on.Oh tempera, oh mores. Every farm has rats to a greater or lesser extent. We are never ratless the farmer assures me, although I have never actually seen one, thank goodness. The number of rats increases as the weather gets colder. In the summer there is plenty of food and in the autumn there is usually a plentiful supply of corn left in the fields after harvest. But now that these supplies are drying up, the rats come in. There are chicken feed bags, cattle feed bags, wild bird food and the like to forage for and every farmer has to be especially vigilant. Our farm cats catch plenty of mice but the farmer has never seen either of them tackle a rat. Rats can be seriously big. The farmer, ever wily, knows where there a couple of regular rat runs. One runs from the back of the compost heap in the veggie garden, along the wall and into the back of the big shed. The other runs from the same compost heap, along the bottom of the veggie garden and under the hen hut. We have, as you know, just bought ten new pullets - small, rather nervous birds - and quite easy prey for a big rat, so the farmer checks the traps each morning. Image his surprise this morning when there was a dead stoat in the trap under the hen house. 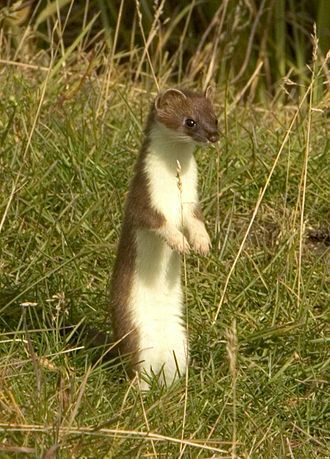 Stoats can be large (this one was the biggest the farmer had ever seen) and could easily steal pullet eggs, or even a small, nervy pullet. But it is sad that they are such predatory animals because they really are quite beautiful - closely related to the ferret I believe. This one is now buried and no longer a threat to our new hens which are settling in nicely and beginning to lay (four our of the ten are laying a small, brown egg daily and the farmer has fixed up a time switched light to give them a bit longer daylight to encourage them to lay. So sorry Mr/Mrs Stoat but you just happened to be in the wrong place at the wrong time. Get up - Farmer 6.20am, me 7.00am after cup of tea in bed. Breakfast 7am to 8am - porridge cooked by farmer, papers to read over breakfast, collected by farmer from local newsagent at 6.45am. (no papers on Sundays). 8am The farmer walks round his estate with Tess. Various activites during the morning - often I meet friends for coffee/scone etc. Farmer does jobs around the farm. 12.30pm. Lunch - our main meal of the day - almost always a cooked meal. prepare tea (usually sandwiches) so that we can sit down together at just after 5pm to watch 'Pointless' over our tea. Tess has hers at the same time. We do a variety of things during the evening, mostly trying to fit in an hour's Rummikub (a game we both enjoy playing) and we almost always go to bed sometime between 10.00 and 10.30pm. Even if we go out to friends in the evening, or friends come round to our house we still wind the evening up about that time, because most of our friends are in the same line of business and need to rise early. We do have set appointments which go on the calendar at the start of each month - Physiotherapist, Hairdresser, Exercise class (for me) and Walking Groups, Auction Markets (for the farmer). My weekly order for food is delivered, having been ordered on line, at the same time each week. Does all this sound boring? Maybe it does to some folk reading it, but to us it makes for an ordered life and one which gives us scope to enjoy life and to make adjustments as and when necessary with the minimum of fuss. People coming to stay are easily accommodated into the routine. Yes, I admit - we are creatures of habit. Are you? "Isn't he wonderful?" says the farmer's niece, Anthea, as not only does she show her surplus ram lambs but gets the Reserve Championship with this chap. He is a Blue-faced Leicester breed (yes, I know, but beauty is in the eye of the beholder). She afterwards sold him for a tidy sum and he has gone off to pastures new, hopefully to sire some splendid Blue-faced Leicesters himself next year. The farmer is very proud of his niece, who not only does contract farm work but also runs a splendid business from home - and is going from strength of strength. She is a brilliant photographer and produces a range of cards, mugs, tea-towels, jig saws and the like (if you want to look at her site her web address is www.AntheaKitching.co.uk) but her real love is the Blue Faced Leicester sheep like the one in the photograph. I must say that I really admire 'enthusiasms' of any kind; she rarely has a spare minute but things go from strength to strength for her and we are delighted to see her prosper so. The farmer has gone off for a walk today with The Wensleydale Society - doing the same walk as he recced last Saturday with C, the leader of today's walk. As we breakfasted the fog came down thick and heavy and it turned icy cold. But as I write the sun has broken through and the sky has cleared and it looks like being a lovely day. I shall now get togged up and go out rubber-gloved to removed the 'end of summer' bedding and prepare the various tubs for putting the spring bulbs in. That is such a satisfying job. Two of our ladies at this morning's weekly coffee morning, just to prove that we are not old fogies in spite of our average age of around 75. Long live the over sixties. Sorry the photograph is so small but it was taken on W's i-phone and if I try to blow it up any larger then it becomes blurred. But you get the general idea - they are holding an artificial anemone between their teeth. E and C were quite pleased to hear that their image would be off round the world - America , Australia, France, Ireland, Wales and the UK are now all able to see them. We do have fun on our Friday mornings. As a child my father used to read me a lot of Poetry - it was his pleasure. I still have many of his poetry books and I look at them often and recall his favourites. He would quote lines of poetry to fit an occasion and his sayings stay with me still. I used to attempt writing poetry myself. I did it for several years until I got so self-critical and realised that it really was very bad poetry. Then I stopped.
. But because today is National Poetry Day I thought I would put one of them on as my post for the day. You can call it Bad Poetry Day if you like - I shalln't be offended. They spread their blue and white cloth. Mown lawns lie, sheltered from the wind. Tom Jones has had the affrontery to say that his wife of 58 years (and before you say 'what a marvellous long marriage, I should point out that he has had numerous sexual dalliances, which he has called 'fun and games') has lost her sparkle, doesn't like going out, refuses to have a home hairdresser, smokes like a chimney and has suffered from depression most of her life. There are two issues here for me. Firstly - what does he expect, does he think she will be jumping for joy; does he think that she will go out and about with confidence (she needs a stair life by the way) while people judge her and agree with Tom Jones that she has indeed 'let herself go'? Secondly - why has she stayed with him all these years? He says that he has a photograph of her as she was in her youth and he keeps it with him always. When he speaks to her on the phone they talk like they are young again. They are still very much in love. Well, he has a nice way of showing it and saying it. Carol Midgley in today's Times says that how folk conduct their marriage is nobody's business but theirs. I disagree when the person involved is somebody so in the public eye as he is. What kind of a role model is he? Alright, he is an oldie so probably no role model for the young, but he does still strut around the stage in his very tight trousers, saying a lot without ever having to open his mouth, and I for one don't like it one little bit. Am I wrong in being judgemental? Now that all our swallows and house martins have gone and the fieldfares are just beginning to arrive, things are very different in the garden. The fieldfares and redwings, our main Winter visitors, rarely come into the garden except in the very cold weather when the odd one might venture to the bird table, especially for suet. They prefer to arrive, strip all the hawthorn berries off every available bush, and then move on to pastures new. And that leaves the way clear for our one constant bird who has just finished moulting and is back in force. Open our back door and a robin is singing loud and clear; open our front door and another robin is singing equally loudly. Go on a walk, as I did an hour ago, down the lane and in the space of half a mile I heard about half a dozen, singing their little heads off - a lovely, clear, sweet-sounding song. But don't be fooled. There is nothing sweet about this little bird so beloved of the Christmas card makers. He will fight to the death if another robin dares to invade his territory and his 'sweet' song is really a war cry - 'keep off'. I read in today's Times (Derwent May's Nature Notes) how the ornithologist David Lack inked out the red breast on a robin and put it out in his resident robin's territory. At the same time he hung some red breast feathers on a wire in the territory. His resident robin completely ignored the stuffed robin but tore the red feathers to pieces. All I can say is it does not make me like the robin any less. He is a cheery bird and alright - he sticks up for his own corner. But I will tell you this for nothing - he absolutely adores meal worms. Put and handful on the birdtable and a handful of shredded suet and you will have him there all day to make sure no other robin gets a taste. Writing yesterday about memories and how times have changed set me off thinking during the evening. I also remembered a very unhappy memory that John (Going Gently) had written about the other week concerning his childhood. Did I have any unhappy memories I asked myself? Well I do remember a walloping I got for running round next door when I was about four and reporting something my mother had remarked about them to my father. Luckily the lady concerned was quite amused by it; but she did tell my mother, who was most embarrassed and gave me a real walloping for doing it (I never did such a thing again and I can't say it hurt my feelings all that much). Some years later, when I was about nine or ten, a really terrible thing happened - and with hindsight I was so grateful that my mother shielded me from the worst of it. Our neighbour (yes, the same one) was by this time a widow and lived with her sister, who was blind. Both were approaching ninety. One day when my mother and I were both upstairs for some reason we heard the sister calling us. She had felt her way round, being unable to see and she asked us to come quickly as 'Lizzie had had an accident'. My mother ran down the path with me in hot pursuit. As my mother rounded the corner she turned and shouted to me to go back home, go indoors and shut the door and not to come out for any reason whatsoever. Her command was so stern that I did as I was told immediately. What had happened was that Lizzie had over-pumped the Primus stove and it had blown up in her face. Her hair caught fire and she ran outside into a breezy day. Within second her clothes were well alight. My mother, seeing this as she rounded the corner, obviously wanted to shield me from the worst sight you could imagine. Although mother wrapped Lizzie in a rug and smothered the flames, she died later in the day. My mother was a strong woman and a wonderful mother to me - my father also adored me and spent hours playing pencil and paper games with me, or walking in the countryside looking for birds' nests or finding wild flowers. But there was one occasion which, after all these years, still hurts when I think about it. When I was around nine, and a terrible chatterbox, always being told to talk less, the 'craze' of the moment was Autograph Albums. You got all your friends to write little verses in them and took them to school to pass around. I wanted one for my birthday - and I was thrilled to get one - a dark green one with gold-edged pages. That evening, when my brother and his wife and my sister and her husband were there for my party cake, I asked everyone to write in it. It was such an exciting moment until I saw what they had all written. I can't remember all the poems/rhymes/sayings - but I remember two, which cut me to the quick. Somebody had written 'Give thy thoughts no tongue' and somebody else had written, 'Silence is golden, speech is silvern'. There were more, all along the same lines. I never took that book to school; I hid it at the back of the drawer - and it still hurts a little. At the last minute the farmer has gone to recce a walk with a friend who is leading the walk next Saturday. The farmer will be going on the walk too but is happy to do it twice. So, a ring round found two friends doing nothing today so out for lunch again. Mushroom soup and risotto - the soup delicious and the risotto mediocre so it will be consigned to our list of 'not to go there again' pubs. The list grows. These days there is such fierce competition that pubs should know better, especially with the finer points: there was a door open into the garden all the time we were there and as there was fog wafting about the dale at times it was quite chilly in the dining room; we had to wait a long time to be served the first course but once we got going service was alright; coffee, obviously filter coffee left on the machine, was bitter and only lukewarm. Did we complain? Of course not, we're British!! But going out to lunch and an incident earlier in the day did set me thinking. When I first came up here almost thirty years ago very few (if any) pubs did lunch. When I was a child, eating out was barely an option except perhaps afternoon tea in Mawer and Collingham, the posh shop in Lincoln, or morning coffee and a scone at The High Bridge Cafe (still there) in Lincoln. Now such places are ten a penny. As for going out - well we didn't have a car - my father never learned to drive and there were very few cars in our village apart from the doctor and the vicar and a judge who had a Rolls Royce and a chauffeur. We had a week's holiday, usually in Skegness, our nearest seaside place and easy to reach on the train. We might occasionally go to visit a relative a few miles away - either by bus or train. But that was it. This morning, when the farmer took the weekly eggs round to our friend and neighbour, it was to find that he had gone with a group of his friends to L A for the week-end. Almost the other side of the world from Thursday to Monday night. How times have changed. Yesterday the bright Autumn sun shone all day and the temperature was up in the high sixties (sorry, I just have not gone metric). Today, after a clear blue sky early in the morning, the fog rolled in and the temperature dropped. It was our Village Church Coffee Morning (I always go to it) and the drive there (about a mile for me) showed the temperature (on the car dashboard and in metric!!) as sixteen. On my return journey two hours later the dashboard showed the temperature as seven. Now, mid afternoon, the fog has cleared but there is no difference at all to the temperature, so taking Tess for her lunchtime walk meant wearing my Winter anorak. And it was jolly cold too. The wood burner is laid ready to light at tea time, the curtains ready to draw across and we can settle down to a cosy evening watching 'Strictly Come Dancing'. Some of my more intellectual friends are horrified that I watch such a programme, but I love the way that rubbish dancers improve week after week by putting in so much practice. The farmer and I are thinking about our next year's Spring holiday. We have been considering a River Cruise, maybe on the Rhine or the Danube. But after talking about it for a couple of days I have to be realistic and say that my mobility is not up to Eurostar - I just could not keep up on the walking to and from the train with the rest of the group. So now we are thinking of Rail Journeys in the UK. If anyone has any experience of these I would be grateful for any suggestions. There are some lovely tours round the coast of the British Isles by boat, but sadly I am the world's worst sailor. It only has to have a ripple on the sea and I am prone in my cabin being seasick. But I really do want the farmer to see a little more of this country a bit further away from home but I don't want him to have to drive there. Decisions, decisions. Large rabbit holes have appeared in the hedge bottom - perhaps a sign that the rabbits are moving house to get ready for winter, although I think they breed almost all the year round (we don't use the phrase 'breeding like rabbits' for nothing). The ash trees are beginning to turn yellow, both the leaves and the 'keys'; we have so many ash trees on our land I do hope we don't get ash die-back, although I suppose it is inevitable. Tess is very kind when she is out in the fields with me; she goes at my pace and if she gets in front then she waits for me to catch up. She rarely goes into the meadows so she really enjoyed the new smells. Although the farmer hit the thistles hard in the Spring when they were young, some escaped and are now covered in thistledown, so beloved of the goldfinches and the reason why there are so few on our niger seed at present. The walls are covered in moss. The farmer added a strand of barbed wire. Although we both hate the stuff, it does discourage the sheep from jumping up on to the wall and making their escape into the lane. Doesn't the lane look inviting in my photograph? While the leaves are still on the trees it reminds me of a lane in a fairy story. In the front garden my schizostyllus is the best it has been for a few years. I think it must be the amount of rain we have had - the plant has managed to stand upright rather than droop over on to the path. We are all hoping that this wonderful Indian Summer lasts over the week-end; it is many a year since we had such glorious weather so late in the year. It is the church coffee morning in the morning - then a free week-end. Enjoy yours whatever you may be doing. The farmer spent yesterday clearing all the briars which have grown over the Summer from the hedge backs because the Winter sheep were coming. The Swaledale sheep, which are hefted on the Buttertubs pass (above) have come down for the Winter to our (relatively) lowland farm. Should a really severe Winter set in then the Buttertubs pass between Wensleydale and Swaledale becomes impassable and the sheep can be buried under feet of snow. So they come down every year. These are gimmers - that is this year's female lambs - who will go back up to The Buttertubs in the Spring, spend the Summer learning their boundaries and getting fat and healthy - then in the Autumn they will be tupped (put to the ram) and in the following Spring they will produce lambs themselves. And so the farming cycle continues. All the briars have been burnt on a bonfire, which means that no sheep will get caught in the hedge - believe me if there are briars there there will always be at least one sheep who will decide to die in that way. A day without being found and the outlook is pretty desperate - and it is so easy to miss one because the more they get entangled the more they struggle. So there we are. Another farming job over for another year. The field opposite was combined yesterday morning (wheat), the straw was baled up in the afternoon; this morning the field is being 'mucked' - they don't waste any time these days on the farm. ***Just adding a note about the word 'hefted' (the word gimmers is explained in the post.) These sheep up on 'the tops' spend their summers up there for the whole of their lives and they learn exactly where they can go, so that this information is passed on generation after generation and only rarely do sheep stray off the territory.